Ever since completing my first wargame, Fardh al-Qanoon, I’ve been eager to tackle the topic of insurgency once again with a more complex manual simulation. Fardh al-Qanoon simulated a local counter-insurgency campaign in a single city during a relatively short period of time, and while I hope it may play an educational role to someone trying to understand the Baghdad Security Plan, such a game is not terribly useful for analyzing counter-insurgency at the national level, which inevitably stretches over a substantial period of time. Fardh al-Qanoon also lacked a critical element: politics. Insurgencies, like all wars, are about political objectives. The short time period of the game meant that the insurgent player’s victory conditions could not be based on actual political objectives of the real insurgents, since there was no way for the player to achieve them within the game’s timeframe. The Coalition player could not co-opt the insurgency through a mix of kinetic action and political accommodation, limiting the toolset the counter-insurgent had at his disposal to win. 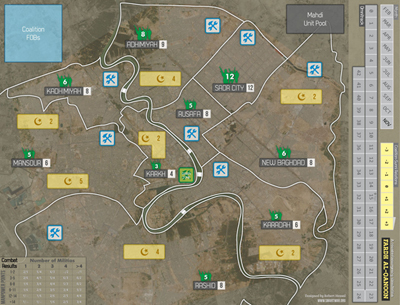 The map for “Fardh al-Qanoon,” a simulation of the Baghdad Security Plan. The two-player game also meant the non-player “third” faction (Iraqi Sunnis) could not be negotiated with. Rules governing such negotiations could have attempted to emulate a live human player representing the Sunnis, but then the problem of “gaming” a non-player faction arises. Randomization mitigates this somewhat, but the more randomness you introduce into a game, the less outcomes depend on player decisions, and thus the less useful the game is for education or analysis. There is, of course, a hard limit to how much you can accurately simulate in a wargame before it becomes far too complex and cumbersome, so carefully-designed randomization systems that abstract complexity can definitely be a benefit rather than a drawback. These issues lingered in the back of my mind as I mulled over the idea of a new insurgency simulation. How should regular and guerrilla forces be represented? How should different quality forces be accounted for? 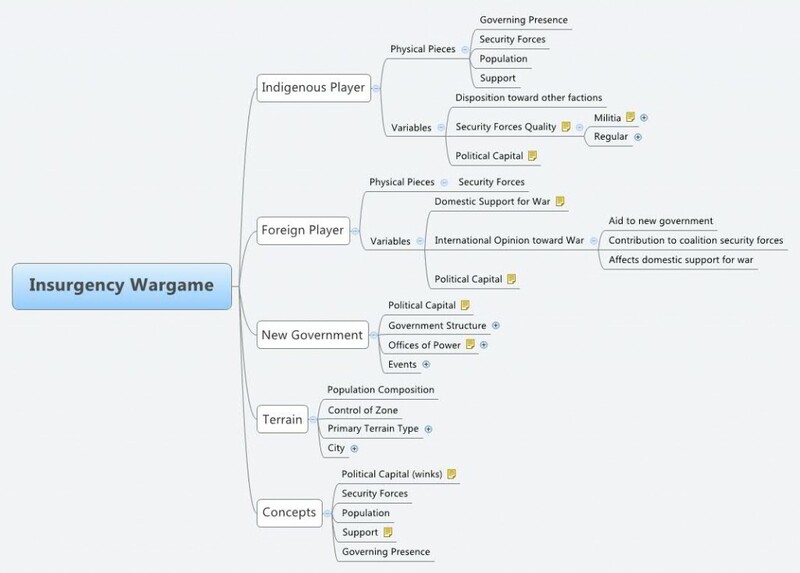 How does a player decide when to use political methods or violence to achieve their objectives? How do players decide when to cooperate or compete with other players? But most importantly of all: how can the simulation be universally applicable? Developing a system rather than a scenario is the most important task of this project. Philip Sabin, my Conflict Simulation professor at King’s College London, wrote a book called Lost Battles that creates a model for simulating ancient battles, both Greek and Roman. Ancient Greeks, Romans, and their various opponents were obviously not uniform entities on the battlefield, but careful design allows the Lost Battles system to account for these differences in a relatively simple ruleset. Most importantly, it allows players to gain valuable insights from recreating battles ranging from the Battle of the Granicus to Cannae. The basic concepts of the simulation should be general enough to apply to any insurgent conflict, with the state of their attendant variables distinguishing one specific conflict from another and creating the unique scenario that each insurgent conflict ultimately represents. First, there is the population. The representation of the population in the simulation should give us an idea of its composition relative to the various factions represented in the simulation and the level of support of the population for factions. The population will be divided in zones of terrain that can represent administrative areas, historical regions, or whatever division of territory makes the most sense for a scenario. Each zone’s primary terrain type is an important factor in determining things like a population’s support for factions (e.g. remote, mountainous terrain is more difficult for a central government to extend its power to), results of military operations, etc. Military force and political capital represent the two dimensions of a faction’s ability to shape the environment. Military forces can be conventional or irregular, with the former requiring greater resources to operate and the latter possessing some of the unique advantages guerrillas enjoy. The ultimate goal of a counterinsurgent or a competing political insurgency is to establish a governing presence in the disputed territory backed by local support. Robert, I have been working along these lines for some time now and perhaps you would be interested at some of what I have done. The game is called “District Commander: Clear Hold and Build”. I have it humming pretty well now and will start making specific scenarios for it when I have the time, instead of the generic Red vs. Blue setting I have now.